Forest City Ratner’s new Nets promotional logo, “Bring it to Brooklyn,” uses the Brooklyn Bridge as a backdrop. Architect Frank Gehry claims the bridge helped inspire the avant-garde architecture for his 17-building Atlantic Yards project. 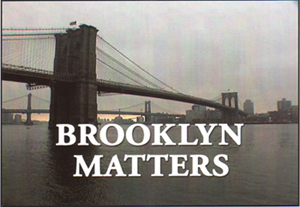 And Isabel Hill’s powerful new documentary about the project, “Brooklyn Matters,” frames its title shot using the bridge. Everyone claims the Roeblings’ bridge, harbinger of modernity when first built in 1883, a stately icon of the borough today, even as population growth, gentrification, and deindustrialization continue to change Brooklyn. Brooklyn “has a unique urban character,” the narrator intones, but “today that identity is being threatened by powerful developers who have their own ideas about reshaping Brooklyn’s future. This is a deciding moment, and the stakes are high.” Hill’s film, less than an hour long, makes a compelling prosecutorial brief against the outsized development. 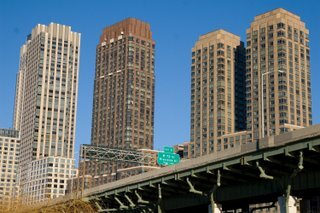 Community members, planners, project critics, and even New Yorker architecture critic Paul Goldberger declare their opposition to top-down planning, a developer spending freely to shape community support, bad urban design, opacity on subsidies, traffic bottlenecks, and eminent domain based on dubious blight claims. The film was shot in a few months, with the goal of influencing the debate on the project, but that was outpaced by the December state approval of Atlantic Yards. It was applauded thoroughly by a packed house—perhaps 200 people—Thursday night at the Center for Architecture. It was followed by a discussion—part analysis, part rally—of the legal fight and the prospects for better planning in Brooklyn and beyond. The film is not, nor is intended to be, a balanced portrait. Forest City Ratner wouldn’t cooperate. (Later documentarians surely will have some footage of point man Jim Stuckey at community meetings.) Supporters like the Reverend Herbert Daughtry, ACORN’s Bertha Lewis, and Brooklyn United for Innovative Local Development’s (BUILD) Marie Louis get only a little screen time. Boosters like Borough President Marty Markowitz and Mayor Mike Bloomberg appear briefly at press events. Critics at times offer exaggerations. 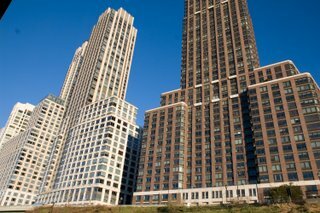 For those new to the controversy, it may be surprising, as a writer for Gothamist noted, that those selling property to the developer had to sign gag orders. Or that Forest City Ratner may be responsible for a portion of the “blight”—empty buildings or poor maintenance—that the Empire State Development Corporation determined as a prelude to condemnation. Shiffman adds, “In order to really experience what Ratner is proposing, you have to add 15 to 20 stories to those buildings.” That’s no longer true. Those in the photos, shot by Jonathan Barkey, are 40-50 stories and, after some cuts, the tallest AY building would be about 511 feet tall. 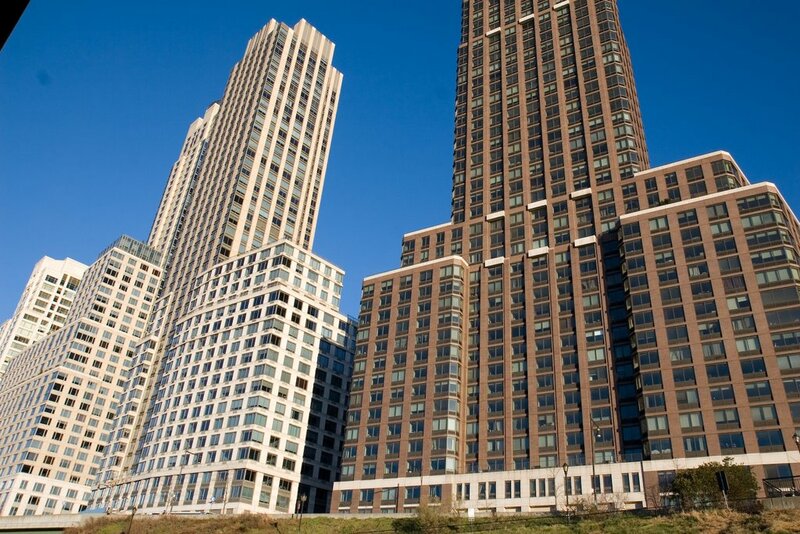 Still, the point is that the community hasn't been shown AY visuals; indeed, the no-towers brochure the developer sent to 300,000 Brooklyn households last May comes in for some scorn. The film captures and magnifies some powerful personalities and indelible moments, especially during the August 23 public hearing and follow-up community forums. Then James segues into a more bureaucratic description: “The project will elevate ozone levels, carbon monoxide, carbon dioxide, and other hazardous particulates…” Boos emerge from the crowd. BUILD’s Louis, in the front row, seems to make a disdainful gesture. Hill, with her camera trained on the line outside, depicts working-class black supporters, wearing stickers indicating membership in BUILD or Public Housing Communities, chanting “I need a j-o-b so I can e-a-t.” Nets star Vince Carter, fresh from a photo-op press conference, jogs by slapping hands. A black woman with a slight Caribbean accent offers a defense of Ratner: “If he doesn’t do it, somebody else will. That area has been a blight for over 35 years and I’ve seen no one stand up.” Listening in is a white woman, with salt and pepper hair, who has the look of a Park Slope Food Co-op member. “You’re talking about my neighbor’s homes,” she says, intervening. Another white woman, community activist Susan Metz, declares, “It hasn’t been blighted for a generation.” The first speaker asks how long she's been in Brooklyn, Metz responds, and the first speaker ups the ante by citing her mother's greater longevity in Brooklyn. "I'm not playing that game," Metz responds. The developer, observes James (who's black), “has attempted to cast this project in terms of race and class,” and indeed that leads to a clash of emotion and reason. Holt’s testimony is followed by a scene with Candace Carponter and Terry Urban, coordinators of the Council of Brooklyn Neighborhoods, two middle-aged, middle-class white women of matronly bearing. Carponter carefully criticizes Mayor Bloomberg’s comment that a call for a delay is to kill the project. “The statement by the mayor is absolutely ridiculous,” she intones, and the room fills with boos. We see Shirley McRae, chairperson of Community Board 2, a woman from the black middle-class, enunciating firmly: “Whether you are for this project or whether you are against this project, the community needs enough time to review these massive documents.” Her bureaucratic request is met with a roar of cheers and boos. The film will be shown at the MAS on January 18 at 6:30 pm and on February 8 at the Fifth Avenue Committee. Later, it will be shown at the Pratt Institute.